The 2017 OC Fair, although now just a memory, is still very fresh in the minds and hearts of the 316 OCWS volunteers whose dedication and enthusiasm made this year’s Courtyard the most successful in OCWS history! With over 1,440 shifts worked at The Courtyard during the Fair, and thousands of hours spent behind the scenes before and after, this year found us smashing records from previous years. The Courtyard grossed the largest income in OCWS history. 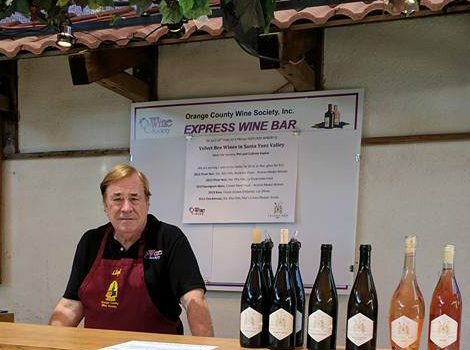 The Orange County Fair & Event Center allowed us to partner with them to run both the Commercial and Home Wine Competitions and also gave us the opportunity to run The Courtyard. Income generated from The Courtyard has paid for both competitions and will cover OCWS’ overhead for the following year. Generous donations made by the general public contributed significantly to our Scholarship Fund. The success of The Courtyard is due in no small part to all OCWS volunteers who manned or maintained The Courtyard in any number of capacities, or by simply lending moral support. It took each and every one of our volunteers to make The Courtyard a success and provide the OCWS with a fabulous financial foundation going into the next year. Thank you to each and every one of our volunteers! From conception to execution, Lloyd Corbett made it happen. Lloyd organized the highly successful Featured Winery Program held at The Courtyard during the OC Fair this year. He extended invitations to those wineries who support the OCWS and entered the 2017 Commercial Wine Competition. The Express Bar, located within The Courtyard, was set up from noon to 4 pm. At this dedicated location, owners and/or winemakers were able to provide tastings or pour full glasses of their currently featured wines, share their winery history, and offer wine club memberships. The participating wineries also had the opportunity to meet OCWS members and its customers. Greg and Pamela Martin of Seven Angels Cellars in Paso Robles. Seven Angels Cellars made a second appearance. We extend our heartfelt thank you to all of the wineries that participated in our Featured Winery Program this year. A special note of appreciation is also extended to these participating wineries for providing additional wine for our use behind the service bar, for special events in The Courtyard during the OC Fair and for our Wine Wall (with proceeds going to our Scholarship Fund). Due to the tremendous success of this year’s Featured Winery Program, we plan to present this new program again next year and add more guest wineries to our lineup, elevating The Courtyard experience for everyone. If any member has a favorite winery you would like to see participate in our Featured Winery Program next year, please have them contact Lloyd and Liz Corbett at Lloyd@ocws.org or Liz@ocws.org.